When brainstorming surprise party ideas, it’s advisable to consider cost and viability along with venue and theme. If the guest of honor typically has an unpredictable daily schedule for example, then it might be a good idea to keep the guest list extremely small and intimate, inviting only those the person interacts with on a daily basis who are able to flex with last-minute changes in schedule. Regardless of who you are throwing the party for, there are a number of ways to tackle cost control. Here are some of my top suggestions. Meeting up after work for a couple of drinks is an excellent ruse for a surprise party. Since most bar and grill joints are OK with bringing out a cake with sparklers or candles, there isn’t a whole lot of prep work involved in setting things up. Schedule your get together for happy hour when drinks and appetizers are offered at reduced prices, and the cost of treating the birthday boy or girl split between the other attendees becomes minimal. Have a small bag of confetti to sprinkle on the table cloth, a candle for a birthday cupcake and perhaps a few noise makers tossed into your tote bag that you can carry incognito from work. There really isn’t much more that’s necessary for this particular party plan. If the parking situation at the guest of honor’s home won’t give away the surprise, then you could also host a happy hour at home for even greater savings. Pot luck gatherings at a beach pavilion work as well for a surprise party as they do for family reunions, because you can pitch the event to the guest of honor as a casual gathering without them knowing there will be special goings on for their benefit. 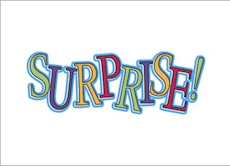 This category of surprise party ideas can include anything from decorations to documentation tools such as disposable cameras, and even gifts. A group card is always a simple and affordable way to go, particularly for work colleagues. Going too far overboard financially for coworkers can be a stressful financial drain, especially when the event occurs near the holidays or a special family event. One card for everyone to sign can easily come out of the office coffee budget without creating any noticeable ripples whatsoever. Other items can be purchased most affordably at places like Dollar Tree and discount department stores, but can be limited to things like table decorations or helium balloons for baby showers, or confetti and sparklers for low-key adult birthday gatherings. You can really go a number of different ways with the food and beverage plan when it comes to developing surprise party ideas. For a couple’s anniversary, friends could plan and decorate for a romantic picnic in the back yard and take care of being the “wait staff” for the evening. This is also a fun way to go for teens who want to do something nice for their folks and don’t have a ton of extra cash to spend. Got a military buddy home on leave? Consider a tailgate party after the big game and make sure there’s a welcome home banner and cake planned into the itinerary. Surprise party ideas for work are easily pulled off with a group pot luck or coupon-purchased takeout pizza and some iced-down bottled beverages. Going away gatherings for college freshman, anniversaries, birthdays and even baby showers are surprise party suggestions that are easily organized. Wedding showers are another good reason to throw a surprise bash. If costs are controlled for those events where gifts are a bit more mandatory, then the monies will be there to do something nice for the recipient that otherwise would have been spent on elaborate decorations or catering. This is by no means a comprehensive list of surprise party ideas, but the article does provide a springboard from which you can affordably plan social events you’d like to recognize in some small manner without looking cheesy. Do you have any surprise party success stories or tales of gatherings gone wrong? Share your story in the comment section below. I’ve been to many surprise type parties for different occasions at a local pub and grill and they always seem like a great place to be. Like you said it’s pretty much effortless and they love to host these types of gatherings. Success all around means I’ll think about hosting one at a pub next time I need to plan one. Forget the office Christmas party. Too busy at that time of year and no need for a party. By January 20, people will not only have more time, but they’ll really need a party.